Travel Neoprene Camera Case Bag soft Protector for DSLR with Lens,Canon EOS 1300D 130D 1200D 750D 700D,60D 70D,7D SX60 SX540, Nikon D3400,D3300,D3200,D5300 D5500,D7200,D7100,D810,D610, OLYMPUS E5 E620,Sony Alpha a7,HX300 HX400,Pentax K5,K3,K50,K500,KS-1 & more DSLR – Size Large L.
protection from knocks,damage and scratches without adding too much weight or bulk to your camera. Easy to carry and provide the best lightweight,compact protection for your travels,outdoor activities. 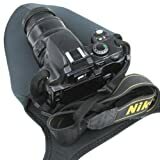 The elastic and foam padding qualities of neoprene protect your valuable camera equipment from bumps,moisture and dirt. Extended flaps wrap around the lens with touch fastener material to secure cover around the camera. The latch system snugly fits the cover around camera to provide minimal bulk and maximum protection. Size: L (23 x 20 x 13cm)；M (20 x 20 x 11cm)；S (16 x 14 x 9cm). S (16 x 14 x 9cm) fits single electric or bridge digital cameras, such as Sony, Pentax, Fujix100, Olympus, etc. The total length of camera and lens put together, which is not more than 13cm. M (20 x 20 x 11cm) fits Long zoom or DSLR camera, such as Canon 550D, 600D, 650D, 700D, 1100D,Nikon D5300 D5200 D3200 D3100, Pentax K-M K-X K100D K200D, etc. The total length of camera and lens put together, which is not more than 16.5cm. L (23 x 20 x 13cm) fits DSLR with lens, such as Canon 700D+18-200, 70D+18-200; Nikon D3200+18-200, D5300+18-200, D7100+18-200. The total length of camera and lens put together, it is not more than 18cm. 1 x Neoprene Camera Case (L). If you need different size of bag, please visit our shop. Posts related to Travel Neoprene Camera Case Bag soft Protector for DSLR with Lens,Canon EOS 1300D 130D 1200D 750D 700D,60D 70D,7D SX60 SX540, Nikon D3400,D3300,D3200,D5300 D5500,D7200,D7100,D810,D610, OLYMPUS E5 E620,Sony Alpha a7,HX300 HX400,Pentax K5,K3,K50,K500,KS-1 & more DSLR - Size Large L.
Travel Neoprene Camera Case Bag soft Protector for Canon EOS 100D,1200D 1300D,750D 760D 700D 650D 600D 550D,SX40 SX50 SX540 SX510 SX520, Nikon D3400,D810,D7100,D7000,D5300 D5200 D5500,D3300,D3200,D3100,FUJI FinePix HS50,SL1000, OLYMPUS.Sony Alpha HX200 HX300 HX400 a7,Pentax K5,K50,K500,& more DSLR - Size Medium M.
This entry was posted in Discount Photography and tagged 1200D, 1300D, 130D, 700D60D, 70D7D, 750D, a7HX300, Alpha, Camera, Case, D3400D3300D3200D5300, D5500D7200D7100D810D610, DSLR, E620Sony, HX400Pentax, K5K3K50K500KS1, Large, LensCanon, More, Neoprene, Nikon, Olympus, Protector, Size, Soft, SX540, SX60, Travel by Ball Photo. Bookmark the permalink.